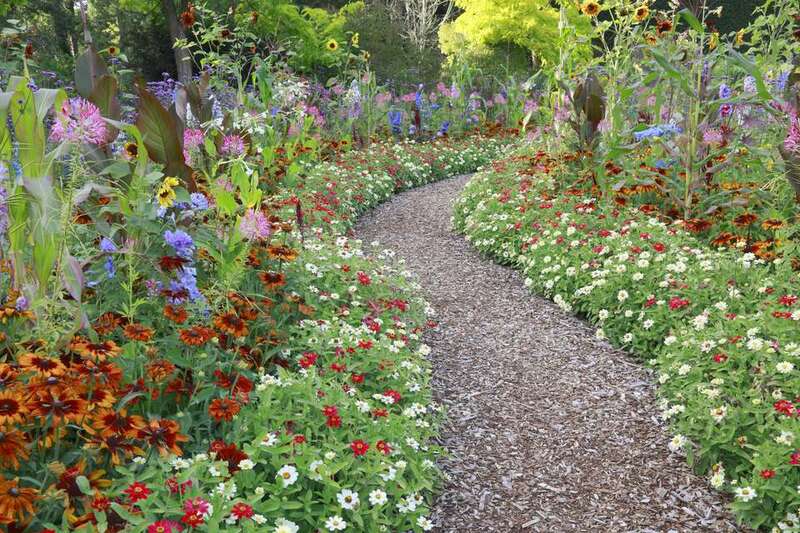 A path is the feature that turns a mere flower border into a full-fledged garden. Garden paths provide access to plants for chores and viewing. A path can divide distinct areas of the garden, such as the cutting garden, the formal garden, the butterfly garden, or the edible garden. Finally, a well-designed path serves an ornamental function as important as the flowers themselves. As anyone with a dog knows, dogs will eventually wear their own paths through the garden, in accordance with their routine. Why not give them a permanent path to make their daily rounds? Choose something Fido-friendly for paws, like soft shredded bark. A vertical accent, like a post, will encourage the dog to mark his territory without wandering into the the plants. Paths can define boundaries in the flower garden, but that doesn't mean they have to appear stiff or unnatural. Trailing flowers like these annual sweet alyssum plants blur the lines where paths end and gardens begin. The sweet honey fragrance of the tiny flowers is a bonus to passers-by. Other flowers ideal for planting at the edge of your garden path include creeping thyme, snow-in-summer, poppy mallow, and creeping phlox. Use caution with blooming ground cover plants that have invasive tendencies, like dead nettle, bugleweed, and vinca vine. By the middle of August, when many flowers are past their prime, one of the most anticipated plants of late summer and early fall is just getting started. The spiky orange blossoms of these dahlias are classified as cactus dahlias, and they're some of the best flower in the genus to grow for beginners. The unusual form of this class means less weight to bear on stems, which means little need for staking, and no disappointing breakage after storms. For similarly striking orange blooms, try growing 'Gatsby,' 'Andries Orange,' or 'Mel's Orange Marmalade.' If you seek giant blooms, be sure to practice disbudding, the technique of removing smaller side blooms in order to direct all energy into one large flower. The garden bench is the passive yin to the active force of the path's yang. A thoughtful placement for your flower garden bench might be at the end of the path, or it could be a particularly striking part of the garden where visitors want to stop and gaze at the landscape. In this photo, a colony of foxgloves invites onlookers to stop and admire the garden's late spring offerings. Well-manicured paths are one of the key defining elements of formal flower gardens. Formal garden paths might be comprised of gravel, bricks, pavers, or even grass, but you are more likely to see straight lines and angles than in casual gardens. A trimmed boxwood hedge is another design element of formal gardens. The flowers you include within these extensively pruned shrubs are up to you, but roses and lavender are common choices. Are native wildflowers your jam? A simple mowed path is in line with the aesthetics of a casual wildflower meadow. Grass paths, moss paths, or paths comprised of other steppable plants fare best in areas that seldom receive foot traffic, which cause unsightly bald patches over time. If you grow a grass path, a mix of clover with the grass seed increases drought tolerance, and also provides fragrant flowers that nourish pollinators. Bricks laid in a herringbone pattern form an alluring path in a woodland garden that features hostas, ferns, and wax begonias. Small natural boulders keep plants in check, and prevent soil from washing onto the path during rains. Gardeners with limited space may be reluctant to devote precious planting areas to a path, but this is a mistake. A curving path adds mystery and a sense of place to a small flower garden. Where does the path go? The true answer may be "nowhere," but the visitor must venture down the path to discover what lies at the end. In small gardens, simply installing a path that curves out of sight can make a garden seem bigger. In a garden, a gate may provide utility, beauty, or both. This egret gate won't keep pets out of the flowers, but it does act as a focal point on the path, and acts as a visual divider to separate the seating area from the rest of the garden. A flower garden that features such mature, vigorous hydrangeas deserves a broad path that accommodates many admirers. However, the cost of constructing such a path may be cost prohibitive. If your path is large but your budget is small, splurge on pavers only as necessary to keep your feet out of the mud. If one of the joys of flowering containers is the variety of flowers you can grow and experiment with in the garden, one of the chores is keeping the plants in these confined environments alive. Smaller containers dry out quickly, but placing them on a path and watering the area around the plants raises humidity and keeps plants moist for a longer period. This is especially beneficial for plants in terracotta pots, which may wick water away from potting soil if allowed to dry out. If you have climbing roses on your mind, consider installing a pergola as an exclamation point on your path. A pergola is a better choice than a trellis for many vines, especially woody perennial vines that can quickly overtake one-dimensional trellises. Wisteria, trumpet vines, climbing roses, and some clematis vines will all display better from the sturdy perch of a pergola. Even if your carpenter skills are rudimentary, you can build a pergola in a weekend with a prefab kit for less than five hundred dollars. Handier gardeners can build a pergola with free plans like this one from Popular Mechanics. Paint it to match your existing architecture, or allow the wood to weather to a natural grey. A rustic cobblestone path invites visitors to stroll past vibrant rhododendrons in a woodland garden. Paths formed from smaller rocks like cobblestone are charming, but may not be the best choice for visitors who desire a surefooted experience in the garden. Frost heaving and other weather vagaries can turn individual cobbles into tripping hazards overnight, so frequent monitoring is necessary. In a low-lying garden subject to flooding, ample use of stone and gravel paths facilitates drainage after heavy rains. Place a permeable membrane beneath the gravel, which lets rain pass through but prevents the gravel from migrating into the soil. The gravel should be about three inches deep to prevent the bottom of the path from being exposed when foot traffic shifts the gravel around. A large cottage garden can become unkempt without a way to access tall plants for deadheading and weeding. Large field stone, granite, or slate paver slabs are heavy enough to be considered permanent, but the spaces between the slabs allow for expansion and contraction in areas with harsh weather extremes. There are several options for installing a flagstone path, ranging from simple placement directly on top of the ground, to filling in the gaps with gravel, rocks, living plants, or mortar. Dry-laid flagstone paths are often set in a bed of sand and gravel for added stability. Peonies, roses, and nepeta await those who wander down this partially shaded path. A freshly laid path makes the heart sing, but a few weeks into the rainy season your tidy gravel or mulch path could be sprouting weeds and grass like so many unwanted whiskers. Keep on top of weeding for a picture-perfect garden, and preferably not as a weekend warrior. Why not make it a goal to pull young weeds for five minutes each evening after dinner? Work in sections, and by week's end, the flower garden will be a respite and not another chore to check off the to-do list. If weed pulling isn't your thing, use a weed prevention product like Preen that contains Trifluralin, which will act as a germination prevention agent for up to three months. Corn meal gluten has similar effects in organic flower gardens. Pink yarrow, orange zinnias, and purple bloody cranesbill are some of the flowers that await the lucky owner of this jam packed summer flower garden. A landscape like this one demonstrates how planting masses of one flower type results in a more pleasing garden design than plopping one of each type of your favorite plant. Traditional cutting gardens are tucked away at the back of the landscape and organized into rows, but why not integrate your cutting garden into the rest of your flower garden, and make it inviting with a well-kept path? Don't worry that your frequent harvests will leave nothing to look at in the garden, as some flowers respond to cutting by producing more blossoms, like zinnias, cornflowers, sweet peas, and cosmos. Lamb's ears, cosmos, and nasturtiums are among the flowers that are easily tended with the addition of a simple path composed of wooden planks. For the longest lasting wood path, use rot-resistant wood like cedar or teak. For an inexpensive option, try upcycling wood pallets into an attractive walking path. One of the determining factors for the width of your garden path might be wheelbarrow or work cart access. Even if the path seems wide enough initially for your garden chores, encroaching plants might narrow the path as the growing season progresses. For most carts, three to four feet provides enough room to maneuver. If you're going to install raised beds or another rigid border along the path, error on the larger side, since you won't be able to cheat your wheelbarrow by rolling it off the path when you need to turn around. Stepping stones are an inexpensive path option that you can install in a weekend. For a lawn path, if you place the stones into the soil, you can mow over them without the need to trim. Lay stones with the centers 18 inches apart for an easy stride. For a garden path you intend to use regularly, safety is a top priority. For paths on slopes, a ratio of no more than 1:20 is suggested for people with disabilities. Regions that experience ice will also need path materials that are navigable in winter conditions. Steps should have a rise between six and eight inches, and should be at least 12 inches deep. Should you install handrails as well? When in doubt, consult a landscape architect. Let a new garden path take your side yard from a pass-through eyesore to a stopover-worthy destination. The side yard is ripe for the charm a garden path brings, and transforms a utilitarian patch that may have housed the garbage bin and air conditioning unit. Pay attention to the orientation of your house, as plant choices on the north side of a structure will differ from the sunny south side. What is a Cold Frame and How Do I Use It?